Here's to the world's best grandma! Scott Lang suits up as Ant-Man with a specialized suit engineered by Pym Technologies that lets him blast into any battle, big or small. Hasbro is doing something kind of weird with these figures: Ant-Man and Wasp are sold in Ant-Man and the Wasp-branded packaging, with their own colorschemes and logos and everything; the other figures - Thor, Black Widow, Malekith and Black Knight - are sold in Infinty War-branded packaging. There's nothing that says an entire series of toys has to all conform to only one property or another, but this is still kind of unprecedented, especially since they all share one BAF. Ant-Man's costume has gotten minorly tweaked since the first film - but we already knew that, thanks to his appearance in Civil War. It's seen some more changes now, though they're fairly slight. In other words, the difference between Ant-Man 1 and Civil War is greater than the difference between Civil War and Ant-Man 2. It's still red and black, with silver accents, and a small metal harness on the collar. Just like Wasp's costume references a wasp face, this one references an ant. That is still amazingly cool design work! The new costume has a belt, which is a separate piece, and the textures of the different areas of the suit are good for this scale. 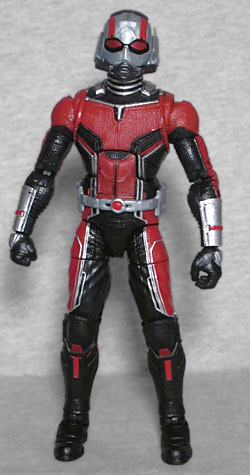 That alone might not make you want to get the toy, but this Ant-Man has two things the original did not: first and foremost is an unmasked Scott Lang head. The likeness of Paul Rudd isn't as perfect as the Evangeline Lilly sculpt was, but that thing was uncanny - this one is merely "very good." He's sculpted with a giant smirk, and his face paint is printed on. That leaves the lips a little too glossy, but it does his stubble great. The second thing the toy comes with is an accurate Ant-Man helmet. Remember how the first movie's toy needed to be customized in order to look right, despite the design having existed for years and years before the movie came out? No such problem today! The helmet covers the entire head, coming to a point over the mouth where the respirator is, and has larger antennae over the ears. A red stripe runs up the forehead above each eye, though there are no painted eyes visible within those lenses like there were on Wasp's helmet. That means this can double as an accessory for him to hold, which is what he's doing in the packaging. As mentioned, the figures in this series all come with a piece of the Cull Obsidian Build-A-Figure, no matter what movie they're from. Specifically, Ant-Man includes the left leg. 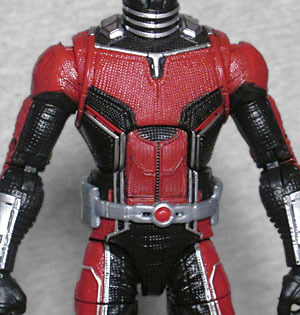 Ant-Man may not feel like a must-have figure, particularly if you don't feel like building Thanos' cut-rate Kalibak, but Hasbro still put the effort in. And as the Ant-Man and the Wasp post-credits scene implies, the character is already warming up for Avengers: Endgame. This entry was posted in blog exclusive review, Hasbro and tagged Avengers, Marvel Legends. Bookmark the permalink. How much of a spoiler can it really be if you can go watch that video on YouTube right now?